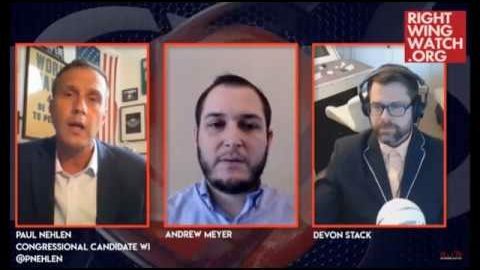 Paul Nehlen, a Republican who is gearing up for another primary challenge to House Speaker Paul Ryan, retreated to a live stream hosted by alt-right flunk-out Tim Gionet, aka “Baked Alaska,” after provoking widespread outrage with an anti-Semitic tweet. Nehlen joined Gionet on Tuesday to air his grievances over being labeled an anti-Semite after he posted a list of verified Twitter users who criticized him whom he believed to be Jewish. Nehlen has also dedicated a page on his campaign website to encourage the harassment of private citizens who criticize him. Vincent James, a frequent talking head on the alt-right YouTube channel “Red Elephants”, also joined the stream. As the blog Angry White Men reports, James recently encouraged the harassment of a Louisiana high school teacher whom he claimed was “anti-white” and “Marxist,” which resulted in a short ban from YouTube. James now claims to have plans for more targeted harassment. Nehlen used an analogy about basketball to further explain his thinking. “If you and I were talking and I said to you something to the effect of, ‘Well, you know, NBA basketball teams are over-represented by blacks,’ and you said, ‘Wait a minute, you can’t say that,’ and I showed you pictures of five NBA basketball teams—predominantly black when the population is only 13 percent black—and you said, ‘Hey, you’re a racist for pointing that out,’ well, I’m not a racist for pointing out observationally correct, factual information,” Nehlen said.